Ok, so I’ve discussed in previous blogs, about the crisp packet and ‘how to hang a door’ and how I finally realised how it was all my fault and I was the problem. For those of you that are finding that there aren’t enough hours in the day to get everything done, if you are like a lot of entrepreneurs working 50-70 hours a week, something has to give. After all, there are only 24 hours in a day, and you can’t possibly work all of those. Even if you work half of them you will still burn out very quickly and instead of growing the company you will, 9 times out of 10, be holding the company back from any sort of growth. One of the first things you really need to do is start working to personal strengths. You need to let go of some, if not most of the things that you do today that you aren’t that good at or dislike doing. I can hear you say, “No way could I do that, nothing gets done without me getting involved”, but imagine if you could come in to work every day and you were only doing the things that you loved to do. Well, there is a way and to help you get started in discovering your passion, your best use, your unique talents within your own company. There is an exercise in the Traction book* called ‘Delegate and Elevate’. 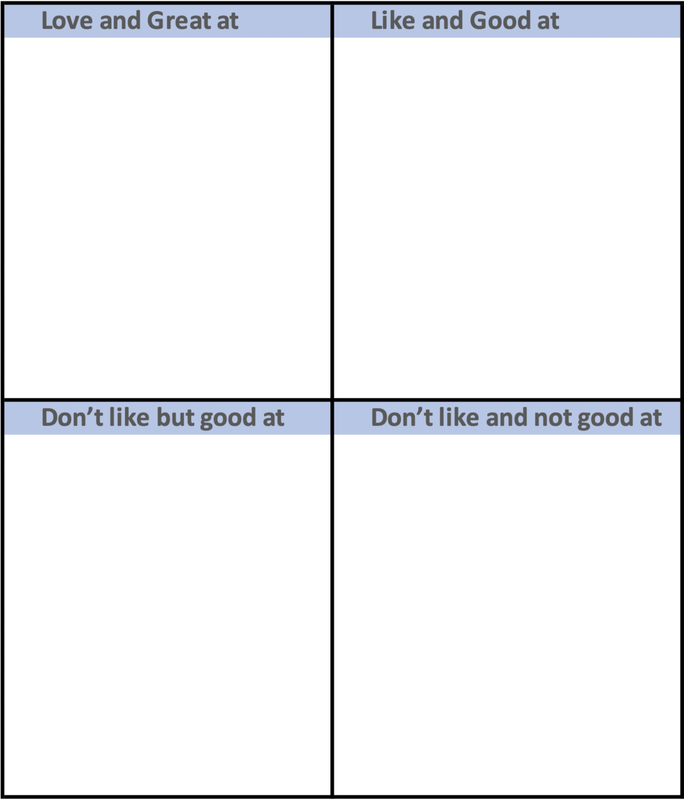 Love and Great at: write down the tasks you love doing and are great at to this box. You know, the work that you get excited about doing. The items you write down in this box are your highest and best use and form part of your unique ability. Don’t Like but Good at: This is when things get tough. This box is where you need to start thinking of those tasks that you may not enjoy, but you know that you probably know them better than anyone. Don’t Like and Not Good at: This for me was the easiest box to fill up. In fact, I extended the box size to accommodate all of those tasks. If you’re doing a task that you know would be better off in someone else’s hands, after all you don’t like doing it and you are not good at doing it, why would you keep it?! It goes in this box. The object of this exercise is to help you understand where your highest and best use is and to help you to move all your time to the top 2 boxes - preferably to the ‘Love and are Great at’ box as soon as possible. The best place to start is to work on delegating the tasks from the, don’t like and are not good at box first. Start getting rid of the things you don’t like doing, especially the ones you’re not good at. These tasks are the real time killers as when we don’t like a task, we don’t do it to the best of our best ability. Once you’ve identified the task you need to a competent person to delegate it to. Begin by looking at your Accountability Chart and ‘GWC’ the person for the task i.e. make sure they Get the task, they Want the task and they have the Capacity to do the task. If they don’t you will just cause bigger issues by delegating it to them. If they do GWC the task, make sure you don’t just dump and run when handing over the task to them. Ensure you have a proper hand over period with training and hand holding of the task until they feel comfortable with ‘what good looks like’ for doing the task. What happens if you don’t have a more competent person in your organisation at this moment in time? Well, you need to start work on your Accountability Chart to get the right people in the right seats as this will enable you to work at your highest and best use. I have included my own personal Delegate and Elevate chart to give you an idea of where to start. All the items that are now highlighted in yellow have been delegated to a more competent person than me. They now have accountability for this role/function. I completed my first ‘delegate and elevate’ chart about 2 years ago. At that time, I was working around 70 hours a week and involved in virtually every area of the business whether I was needed or not. It took me nearly a year to delegate most of the functions that I didn’t enjoying doing to other competent people. I am now down to what is definitely a more reasonable level, working 28 hours a week. Staff are also individually developing and growing, the business is going from strength to strength and, much more important than any of that, I am working to my unique strengths and back to being happy with my role at ATG-IT.